There are 35 Assisted Living Facilities in the Oklahoma City area, with 27 in Oklahoma City and 8 nearby. The average cost of assisted living in Oklahoma City is $3,155 per month. This is lower than the national median of $3,346. Cheaper nearby regions include Del City with an average starting cost of $2,500. To help you with your search, browse the 306 reviews below for assisted living facilities in Oklahoma City. On average, consumers rate assisted living in Oklahoma City 4.1 out of 5 stars. Better rated regions include Del City with an average rating of 4.8 out of 5 stars. Caring.com has helped 42 families in Oklahoma City find high-quality senior care. To speak with one of our Family Advisors about assisted living options and costs in Oklahoma City, call (855) 863-8283. Oklahoma City is home to a large number of federal employers, including Tinker Air Force Base and the Mike Monroney Aeronautical Center. Many employees from these facilities retire to Oklahoma City, accounting for much of the senior population of 11.7 percent. The area has a total of 51 assisted living facilities for seniors, including 27 within Oklahoma City. Assisted living facilities provide seniors with help in daily living, including eating, grooming, medication reminders and general care. The Oklahoma State Department of Health regulates these facilities, which are officially known as assisted living centers in Oklahoma. Senior citizens living in Oklahoma City will need to be prepared for the severe weather that routinely occurs during late spring. Tornadoes and hailstorms are common at this time of year. The cost of living in Oklahoma City is about 87 percent of the national average, which is particularly low considering its size. Most of this difference is due to the low cost of housing, but other living expenses are also below the national average. Oklahoma has a high crime rate like other large cities and is safer than only 7 percent of all U.S. cities. Its annual rate of crimes is 47.47 per thousand people, which is significantly higher than the 34.33 per thousand people for all of Oklahoma. EMBARK handles public transportation for the entire Oklahoma City metroplex. Many classes of passengers are eligible for discounted fares, including senior citizens who are at least 60 years of age. Passes that allow unlimited travel for a specific period of time are also available for seniors at a discount. The MAPS 3 Senior Health and Wellness Centers in Oklahoma City provide seniors with a range of services, including social activities, recreation, health and adult education. Two MAPS 3 centers have already been completed and two others are in progress. These facilities are independently operated, so the specific programs vary considerably. The Oklahoma City area is home to world-class medical facilities, including St. Anthony Hospital, Mercy Health Center and Alliance Health Midwest, in the event of medical emergencies or illness. Assisted Living costs in Oklahoma City start around $3,222 per month on average, while the nationwide average cost of assisted living is $4,000 per month, according to the latest figures from Genworth’s Cost of Care Survey. It’s important to note that assisted living rates in Oklahoma City and the surrounding suburbs can vary widely based on factors such as location, the level of care needed, apartment size and the types of amenities offered at each community. 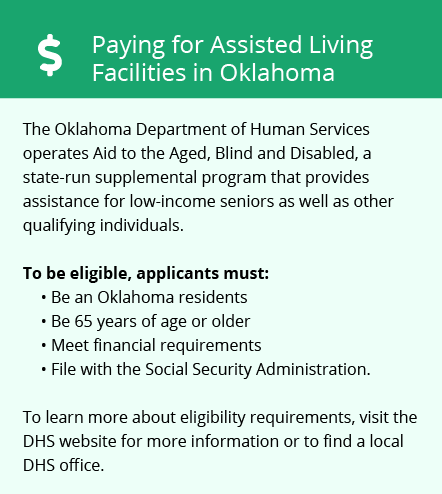 Oklahoma provides financial assistance with assisted living through a variety of Medicaid Waiver programs. For example, the the OK Sooner Services program is available for senior citizens 65 years of age and older. 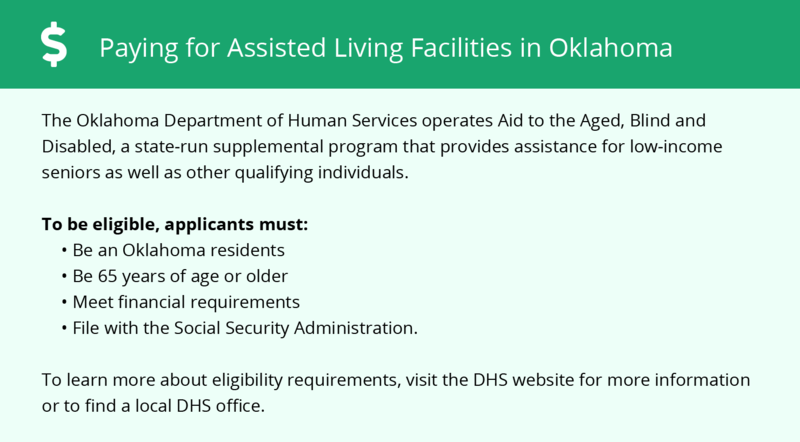 Oklahoma City and the surrounding area are home to numerous government agencies and non-profit organizations offering help for seniors searching for or currently residing in an assisted living community. These organizations can also provide assistance in a number of other eldercare services such as geriatric care management, elder law advice, estate planning, finding home care and health and wellness programs. To see a list of free assisted living resources in Oklahoma City, please visit our Assisted Living in Oklahoma page. Oklahoma City-area assisted living communities must adhere to the comprehensive set of state laws and regulations that all assisted living communities in Oklahoma are required to follow. Visit our Assisted Living in Oklahoma page for more information about these laws.